Five badges on a Resident's profile. A badge is a collectable icon that displays on a Resident's profile. Badges are entirely aesthetic - they have no effect on gameplay. Once a Resident has obtained a badge, it is permanently visible on the user's profile and cannot be removed. Each badge can only be obtained once. The order of the badges on a profile is predetermined and identical for all users. Spoiler warning! This section contains information that may spoil your enjoyment of discovering the game's secrets for yourself. There are 7 known obtainable badges in the game. Conditions: Donate a minimum of ((Number of players active in last 48 hours) - 1) Garlic to the Giving Tree in a single donation. The number of active players can be viewed on the statistics page. Conditions: Donate a minimum of ((Number of players active in last 48 hours) - 1) Bacon to the Giving Tree in a single donation. 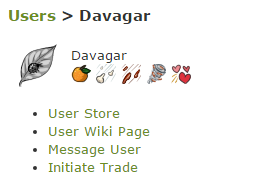 The number of active players can be viewed on the statistics page. Conditions: Donate a minimum of (Unknown value) Bacon to the Giving Tree. Conditions: Have another Resident (whose account must be at least 6 months (181 days) older than yours) click the 'Love on this Resident' button on your profile. Conditions: Help 20 ghosts in the Pattern during the Halloween event. Conditions: Report game bugs to Onyx, the owner of TerrePets. You can reports bugs by posting on the Plaza's Error Reporting section, by emailing terrepets@gmail.com or by sending Onyx a personal message in-game. The exact number of bugs needed to obtain this badge is unknown. This page was last modified on 19 March 2017, at 16:41.